How to get there: A natural starting point is the ski area Thredbo Village. We arrived by car from Melbourne via Hwy. 31 through Wodonga and Corryong (stayed in a nice motel in Corryong, owned by a lady that had lived 3 years in Langesund, Norway). From the north, the access would be via Cooma and the village Jindabyne. There is a dollar 15 (Australian) fee per day to stay in the national park. The fee is collected at a park entrance station between Jindabyne and Thredbo. Thredbo village is a typical alpine skiing area with shops, restaurants and generally expensive accommondation, but with a range of choices. However, there is not a single place in Thredbo that will (or can) rent you cross country skies. (We therefore had to make an extra trip to Jindabyne and back.) The recommended place to rent cross country (back country touring skies, nordic type) is Wilderness Sports in Jindabyne, it is located at the lower level of the large shopping center that is south (to the right when coming from Thredbo) of the highway. Ask for Bruce, a very friendly and competent guy, the local phone number to the store is 64562966. 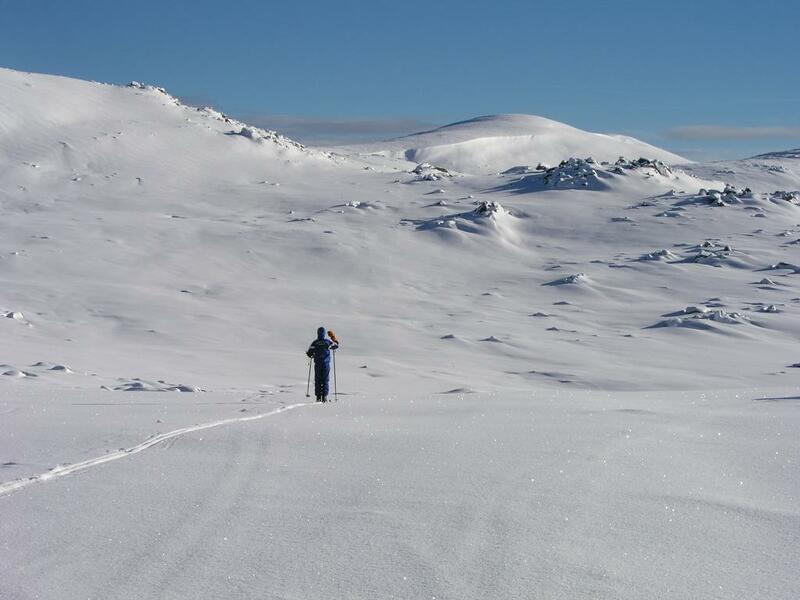 Route description: The only viable way to ski when starting from Thredbo, is up the downhill ski slope. We started at the bottom of the hill (1380 meter, GPS: South 36:30.231, East 148:18.200), then climbed almost to the top chair lift, (we left the slope and went right just before the final hill leading to the top station) into a basin where two creeks merge (1960 meter, GPS: South 36:29.336, East 148:17.024). From here, continue slightly right, with a somewhat ragged ridge on your left. In summer, the "official walk-way" to the mountain starts here (there is a sign that may be visible). The ridge crest provides the first sight of Mount Koscuiszko, (2070 meter, GPS: South 36:28.796, East 148:16.667). Continue straight towards the summit, this will involve a small descent before climbing to the saddle between the Rams ridge (left) and Etheridge (right). Ski into this saddle, continue on the left side of Etheridge, gently climbing to the distinct saddle called Rawson Pass, (2010 meter, GPS: South 36:27.457, East 148:16.121). 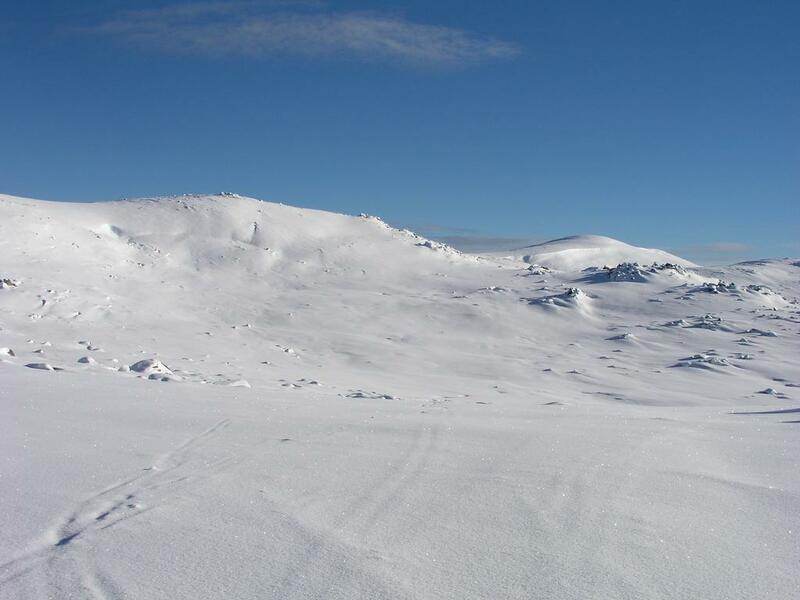 From the pass, continue climbing the slope, traverse left and gain the south ridge of Mount Kosciuszko, then follow the top ridge to the summit. Comments: I did this climb with my son Pål Jørgen, age 14. We started in the Thredbo village at 0650, struggled a bit on waxless skies (the only kind one can rent) up the newly groomed downhill, the skiing improved as soon as we could leave the downhill area. 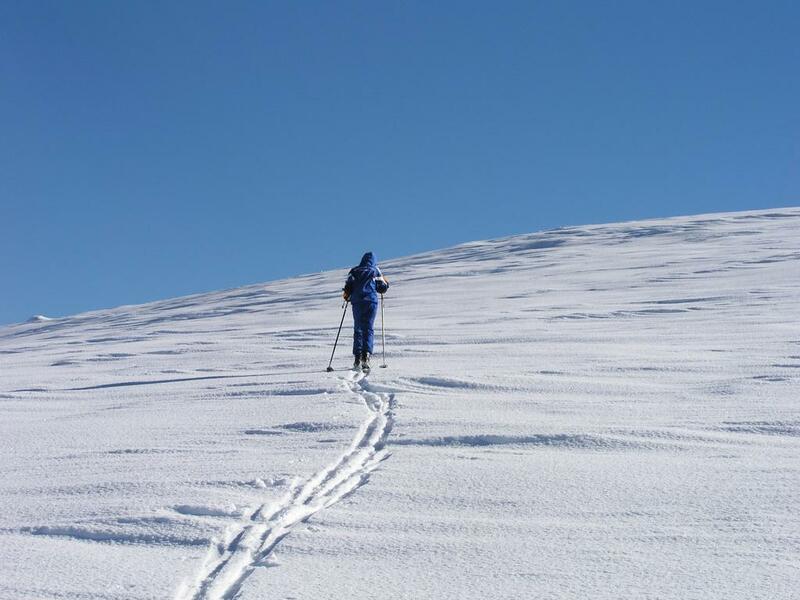 We continued in beautiful morning weather, breaking trail in virgin, soft snow. The top of the Australian continent reached at 1005. The weather seemed to hold (there were clouds moving in from the east), so we continued to Mount Townsend, 2209 meter and the second highest peak in Australia, reaching its summit at 1135. On the return we skied to the summit of our third peak for the day, Rams Head at 2195 meter (see separate comments under this peak), on this summit at 1410. Back at the lodge in Thredbo well before 1500. A fantastic 8 hour ski trip in Australia. It is likely to be my only mountaineering skiing on this continent, I am therefore extremely grateful to my good companion Pål Jørgen and to the weather that turned exceptionally good despite a pretty miserable forecast as well as poor weather the day before. Mount Kosciuszko, the first view. 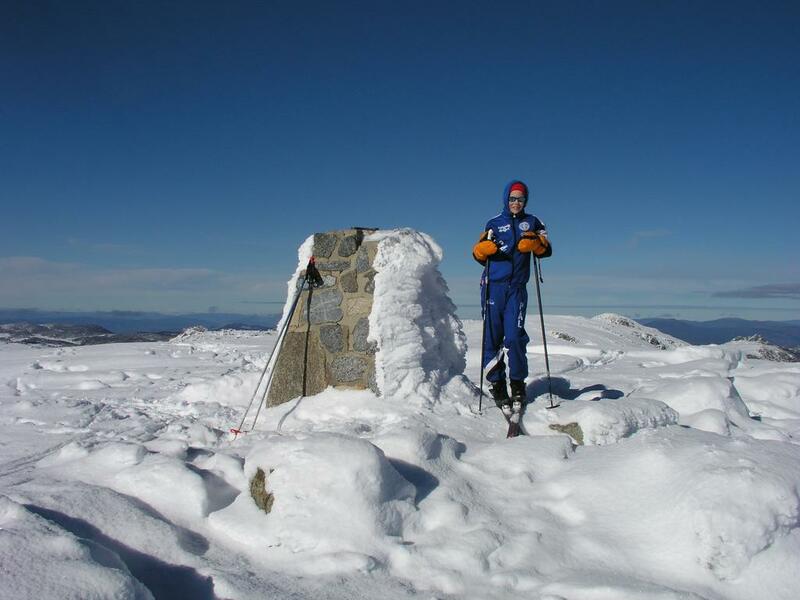 Mount Kosciuszko, Pål Jørgen breaking trail. Pål Jørgen near the summit.